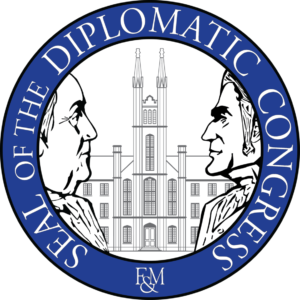 Diplomatic Congress is the central student government at Franklin & Marshall College. It is comprised of individuals who represent student groups throughout campus and, in many ways, is tasked with the responsibility of leading the student body. Diplomatic Congress members include an executive board, class presidents, a faculty advisor, and college house representatives/college house leaders. Representatives from agencies such as College Entertainment Committee, Club Council, and Creativity & Innovation, as well as those from on-campus committees such as Diversity Committee, Sustainability Committee, Academic Achievement Committee, Health and Safety Committee, and Community Outreach Committee, also serve on Diplomatic Congress. The Mission Statement of Diplomatic Congress reads: “As the central student government of Franklin & Marshall College, the Diplomatic Congress unites student leaders from all facets of the community with the common purpose of promoting a diverse and engaging campus culture and improving all aspects of the student experience. To this end, The Congress is tasked with the primary responsibility for all-campus event planning, for the funding and oversight of student activities, and for advocacy on behalf of students on all critical matters facing the college” (fandm.edu). Diplomatic Congress meetings include updates from members, discussions about upcoming events, discussions about potential solutions to on-campus problems or qualms, a wide range of proposals concerning all areas of campus, and funding requests. To speak to funding requests, many clubs and organizations as well as individual students require money from F&M in order to sponsor different events and activities. As Diplomatic Congress stands at the moment, the student government has some money—but not very much—to supply funding for these events. The pool for the majority of that money stands with the College House governments. Bonchek Congress, Brooks Congress, New College House Senate, Ware Parliament, and Weis Assembly of Peers are the five college house governments at F&M. Their primary responsibility is to establish community through programing within their respective college houses as well as fund events for student organizations on campus. Diplomatic Congress has devised a new proposal titled: “Simplifying Student Organization Funding,” which can be viewed here: https://docs.google.com/document/d/1HSQ0KdyAznc74kwmqWABr6sPzikCbo8rPXSmTF7FLw/edit. The majority of funding power, as it stands, rests chiefly with the house governments. With the current system in place, each funding request is presented to each house government at their weekly meetings. All members of these individual house governments hear funding requests and decide whether or to fund in full, fund partially, or not fund events at all. This requires clubs and organizations to send a club member to each of the five house government meetings. The goal of the new proposal is to simplify the process for individuals to make funding requests. Rather than attending each house government meeting, those making funding requests will only be required to attend the Diplomatic Congress meeting, where the leaders of each house government will be present. In order for this proposal to work, house governments must cede some of their money to Diplomatic Congress. The pushback seems to be that some of the autonomy that currently rests with the college house governments would be taken away and their representation will be limited because only one member of each house government will hear and be able to vote on the actual funding request at the Diplomatic Congress meeting. Naturally, this proposal—and the advantages and disadvantages that go with it—is more complicated and includes more details than have been presented here. Please visit the proposal in order to better understand Diplomatic Congress’ potential changes to the current funding system. This new proposal may be an easier, more efficient way to distribute funding across clubs and organizations, but it also takes away leadership and independence from the College Houses. The question is, is this the best step for Diplomatic Congress and F&M’s campus at large? The college house governments have varying opinions on the matter. Look out for updates in the coming weeks regarding whether or not Diplomatic Congress ultimately adopts this new system. If you have any thoughts or concerns regarding the proposal itself, please email diplomatic.congress@fandm.edu. All Diplomatic Congress meetings are open. Junior Alex Pinsk is the Editor in Chief. Her email is mpinsk@fandm.edu.